Unique EZ-Step stair climbing cane helps you take half a step at a time for safe, confident stair climbing. Simply step onto the textured base first, then onto the stair. By reducing the range of motion needed to climb stairs, lightweight EZ-Step helps minimize discomfort and worry. With non-slip rubber feet and a comfort-grip handle, it’s also perfect for use as a quad cane for walking, climbing curbs, and getting in and out of cars. Watch this Youtube video. Walking cane supports up to 350 lbs. Aluminum stair stepper with plastic step. The EZ-Step stair climbing cane is a great tool that will help individuals with difficulty climbing or descending stairs to do so much more easily and in a safe, confident manner. 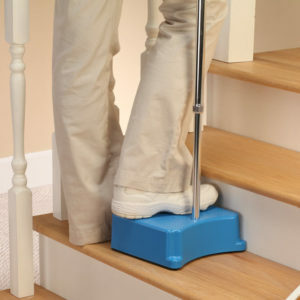 The individual carries a cane-like device that includes a half height step that makes up the cane base Simply step onto the textured base first, then onto the stair. Because the individual only needs to lift themselves a half step at a time, lightweight EZ-Step helps minimize discomfort and worry. With non-slip rubber feet and a comfort-grip handle, this device can also function as a quad cane for walking, climbing curbs, and getting in and out of cars. The EZ-Step cane has helped many people with disabilities retain the independence to move around their own homes without assistance even when they are unable to safely climb a full-height set of stairs. The process works by placing the cane next to the step, stepping up on to the cane (only a half step up) then stepping from the cane on to the step (another half step up). Then pull the light-weight cane up alongside you on the first step, and repeat the process to get up on to the second step. Going down is just the reverse of going up. Place the cane on the step below, then step on to the cane platform, and then step on to the lower step. The cane is easy to assemble, with only one screw to tighten to attach the cane on to the cane-base. EZ-Step stair climbing aid comes in 4 different available colours, the standard aluminum Blue, plus Blackberry, Pink and Midnight Blue. We can ship to you anywhere across Canada at no additional cost within 24 hours of placing your order. You are welcome to call Tom at 1-855-636-5705 if you need more information about any aspect of how the cane is used, or contact us through our contact form. Order this unique stair-climbing aid today.